The word is used, in a technical sense, in the Hindu re!igion to denote the descent upon earth of a portion of the essence of a god, which then assumes some coarser material form, be it animal, monster, or man. Such descents are ascribed in the mythology of Hinduism to various gods, but those ascribed to Vishnu are by far the most important. They are believed to have taken place at different ages of the world, and to have consisted of different proportions of the essence of the god Vishnu. Their number is variously stated, ranging from ten to twenty-eight, finally becoming indefinitely numerous. Any remarkable man is liable to be regarded as a more or less perfect avatar of Vishnu, and the consequence one of the worst features of Hinduism - has been the offering of divine homage to men, especially the founders of religious sects and their successors.  In Hinduism, an avatar or avatara, is the incarnation (bodily manifestation) of an Immortal Being, or of the Ultimate Supreme Being. It derives from the Sanskrit word 'avatara' which means "descent" and usually implies a deliberate descent into mortal realms for special purposes. The term is used primarily in Hinduism, for incarnations of Vishnu the Preserver, whom many Hindus worship as God. The Dasavatara (see below) are ten particular "great" incarnations of Vishnu. Unlike Christianity, and Shaivism, Vaishnavism believes that God takes a special (including human) form whenever there is a decline of righteousness (dharma) and rise of evil. Lord Krishna, an avatar of Vishnu, according to Vaishnavism that is espoused by Ramanuja and Madhva, and God in Gaudiya Vaishnavism, said in the Gita: 'For the protection of the good, for destruction of evil, and for the establishment of righteousness, I come into being from age to age.' (Bhagavad Gita, Chapter 4, verse 8.) In any event, all Hindus believe that there is no difference between worship of Vishnu and His avatars as it all leads to Him.The word has also been used by extension by non-Hindus to refer to the incarnations of God in other religions, notably Christianity, for example Jesus. The philosophy reflected in the Hindu epics is the doctrine of the avatar (incarnation of Vishnu or God as an animal or a human form). The two main avatars of Vishnu that appear in the epics are Rama, the hero of the Ramayana, and Krishna, the advisor of the Pandavas in the Mahabharata. Unlike the superhuman devas (gods) of the Vedic Samhitas and the abstract Upanishadic concept of the all-pervading Brahman, the avatars in these epics are intermediaries between the Supreme Being represented as either Saguna Brahman or Nirguna Brahman and mere mortals. This doctrine has had a great impact on Hindu religious life, for to many it means that God has manifested Himself in a form that could be appreciated even by the least sophisticated. Rama and Krishna have remained prominent as beloved and adored manifestations of the Divine for thousands of years among Hindus. The Upanishadic concept of the underlying unity of Brahman is revered by many to be the pinnacle of Hindu thought, and the concept of the avatars has purveyed this concept to the ordinary Hindu as an expression of the manifestation of the Hindu's highest single divinity as an aid to humanity in difficult times. The Hindu cycle of creation and destruction contains the essence of the idea of "avatars" and indeed relies on a final avatar of Vishnu, that of Kalki, as the final destructive force at the end of the world. Dashavatara refers to the ten principal avatars. In Vaishnava philosophy, an avatar, most commonly refers to the 'descent' and dais refers to 'ten' in number. 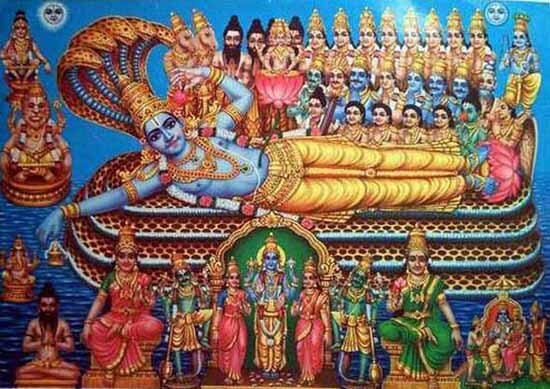 The ten most famous incarnations of Vishnu or sometimes Krishna are collectively known as the Dashavatara. This list is included in the Garuda Purana (1.86.10-11) and denotes those avatars most prominent in terms of their influence on human society. The majority of avatars in this list of ten are categorized as 'lila-avatars'. The first four are said to have appeared in the Satya Yuga (the first of the four Yugas or ages in the time cycle described within Hinduism). The next three avatars appeared in the Treta Yuga, the eighth incarnation in the Dwapara Yuga and the ninth in the Kali Yuga. The tenth is predicted to appear at the end of the Kali Yuga in some 427,000 years time. According to the Vishnu Purana and Bhagavata Purana, the Kali-yuga will end with the apparition of Kalki-avatara, who will defeat the wicked, liberate the virtuous, and initiate a new Satya Yuga. 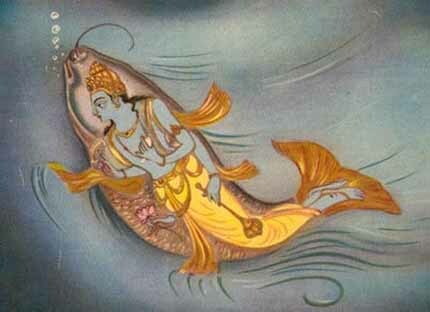 Matsya The Fish Incarnation is the first incarnation of Vishnu. 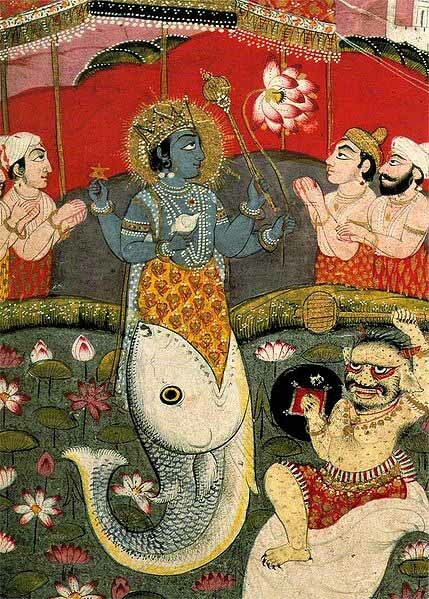 Lord Vishnu takes the form of a fish in order to retrieve the Vedas from the demon Hayagriva, who stole them from Lord Brahma. Without the Vedas, Creation of the Universe cannot take place. He slayed the demon Hayagriva, recovered the Vedas, and also saved the pious king Satyavrata from the deluge so that life and religion can be preserved for the next cycle of Creation. Kurma, the tortoise, appeared in the Satya Yuga. The turtle Incarnation is the second incarnation of Vishnu. When the devas and asuras were churning the ocean in order to get the nectar of immortality, the mount Mandara they were using as the churning staff started to sink and Lord Vishnu took the form of a turtle to bear the weight of the mountain. Vishnu in this form offers his back as the pivot on which rests Mt. Mandara, while the gods and demons churn with it various valuable objects from the ocean of milk. In Hinduism, Kurma was the second avatar of Vishnu. He took the form of a tortoise and sat on the bottom of the ocean after the Great Flood. A mountain was placed on his back by the other gods so that they could churn the sea and find the ancient treasures of the Vedic peoples. The Churning of the Ocean itself forms an interesting legend. In the ancient times, both the Devas (divinities similar to Greek Gods) were mortal. Their enemies were the Asuras. One day, the King of the Devas, Indra was riding his elephant when he came upon a sage. The sage decided to honor Indra by giving him a scented garland. Indra took the garland, but placed it on the forehead of his elephant. The elephant was irritated by the scent and threw the garland off, trampling on it. The angry sage gave Indra a curse that he and the Devas would begin to lose all their energy and power. The Devas feared that the Asuras would take over the whole world. Therefore, they prayed, and the Hindu Trinity suggested a solution: churn the Ocean of Milk in order to obtain the Nectar of Immortality. However, the Devas could not churn the Ocean themselves. They struck a temporary truce with their enemies so that all could participate in the churning. The Ocean was churned by using the mountain Mandara and the snake Vasuki wrapped around it. Each side would hold an end of the snake and pull on it alternately, causing the mountain to rotate, which in turn would cause the Ocean to be churned. However, once the mountain was put on the Ocean, it began to sink. Then, Vishnu incarnated in the form of a turtle to support the mountain. As the ocean was churned, a deadly poison known as Halahalal emerged. This poison threatened to suffocate all living things. In respons to various prayers, Shiva drank the poison and held it in his throat. This caused the throat to turn blue. Then, various people, animals, and treasures emerged. Dhanavantri, the Heavenly Physician, emerged with a pot containing nectar. As the Asuras rushed to take the nectar, the frightened Devas appealed to Kurma, who then turned himself into a maiden named Mohini. The damsel distracted the Asuras, while the Devas secretly drank the Nectar. One Asura suspected foul play, disguised himself as a Deva, and drank some Nectar. But before the Nectar could pass his throat, Vishnu cut off the head. The head, however, remained immortal. It is believed that this immortal head occasionally swallows the sun or the moon, causing eclipses. Then, the sun or moon passes through the opening at the neck, ending the eclipse. Varaha, the boar, appeared in the Satya Yuga. 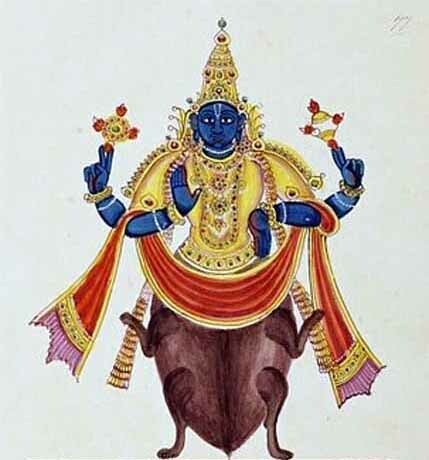 The Boar incarnation is the third incarnation of Vishnu. He appeared in order to defeat Hiranyaksha, a demon who had taken the Earth (Prithvi) and carried it to the bottom of what is described as the cosmic ocean in the story. The battle between Varaha and Hiranyaksha is believed to have lasted for a thousand years, which the former finally won. 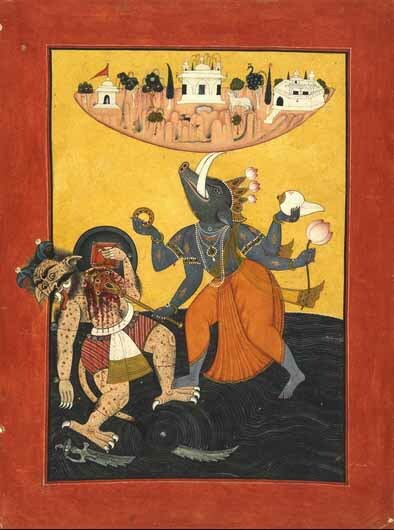 Varaha carried the Earth out of the ocean between his tusks and restored it to its place in the universe. Varaha is depicted in art as either purely animal or as being anthropomorphic, having a boar's head on a man's body. In the latter form it has four arms, two of which hold the wheel and conch-shell and the other two hold a mace, sword or lotus or form a blessing posture. The earth is held between the boar's tusks.The avatar symbolizes the resurrection of the earth from a pralaya (deluge) and the establishment of a new kalpa (cycle), and can thus be considered to constitute a creation myth. The Varaha purana is a purana in which the form of narration is a recitation by Varaha. A very ancient temple lies in Tamil Nadu goes by the name of Sri Mushnam, and is considered a "svayambhu" murthi like Tirupati and Badrinath. Narasimha The Man-lion is an avatara of Vishnu described in the Puranas, Upanishads and other ancient religious texts of Hinduism, and one of Hinduism's most popular deities, as evidenced in early epics, iconography, and temple and festival worship for over a millennium. He is often visualized as half-man/half-lion, having a human-like torso and lower body, with a lion-like face and claws. 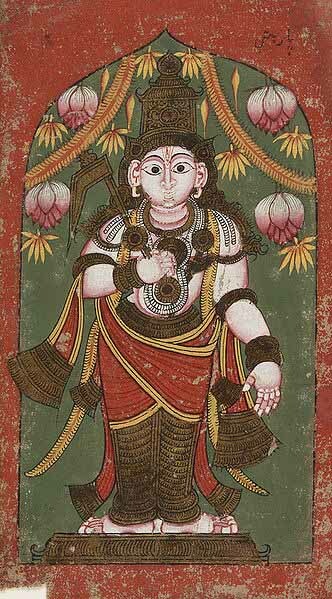 This image is widely worshiped in deity form by a significant number of Vaishnava groups, particularly in Southern India. He is known primarily as the 'Great Protector' who specifically defends and protects his devotees in times of need. Vishu takes this form to deliver the world from a demon, who had obtained from Brahma the boon, that he should be slain neither by a god, a man, nor an animal. In his previous avatar, Vishnu was Varaha and killed the demon Hiranyaksha, whose brother, Hiranyakashipu, was greatly angered by this. 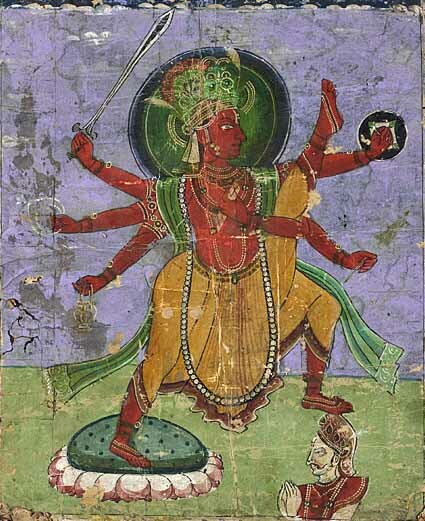 Hiranyakashipu decided to gain magical powers by performing a penance for Brahma. Hiranyakashipu asked for a boon from Brahma that he would not die on Earth or in space, nor in fire or water, not during the day or night, not inside or outside, and not by the hand of a human, god, animal or any other animate or inanimate species. Brahma was pleased with his penance and granted the boon. Hiranyakashipu, a Daitya, hated the gods and most especially Vishnu, the followers of whom he began to torture. Hiranyakashipu's son, Prahlada, was a very devoted follower of Vishnu. Hiranyakashipu failed in convincing his son to join him against Vishnu, and tried to kill him, but Prahlada was protected by Vishnu. When asked, Prahlada refused to acknowledge his father as the supreme lord of the universe (though he had used his boon to conquer the entire world) and claimed that Vishnu was omnipresent. Hiranyakashipu asked if Vishnu was in a particular pillar and Prahlada answered he was. Hiranyakashipu smashed the pillar, and Narasimha came from it. Narasimha killed Hiranyakashipu, since he was neither human nor animal nor god (an avatar is a human, but this avatar was only part human and part animal) and did so during twilight (neither day nor night), placing him on Narasimha's thighs (not on earth, nor in space), on the threshold of the entrance to a courtyard (neither inside nor out) and using nails (neither animate nor inanimate) as weapons. Vamana, the dwarf, appeared in the Treta Yuga. The fourth lineal descendant of Hiranyakashyap, named Bali, through his devotion and penance defeated Indra, the god of firmament, humbled other gods and extended his authority over the three worlds. All the gods appealed to Lord Vishnu for protection and He became manifest in His Dwarf Avatar of Vaman for the purpose of restraining Bali. Once when this king was making a great religious offering, Lord Vishnu in the form of Vaman appeared before him in the company of other Brahmins. Bali was extremely pleased to see a holy man with such a diminutive form and promised to give him whatever he should ask. Lord Vishnu asked only for as much land as he could measure by three steps. Bali laughingly agreed to grant the boon of three steps. Lord Vishnu as dwarf stepped over heaven in first stride and earth in the second stride. Then he asked Bali where can he put his third step . Bali realized that Vamana was Vishnu incarnate and his pride was broken. He offered Vamana to put his third step on his head. Vamana did so and thus blessed Bali marking him as one of the few immortals blessed by Vishnu. Then out of respect to Bali's kindness and his grandfather Prahlad's great virtues, he made him the ruler of pathala, the subterranean region. Bali is believed to have ruled Kerala and Tulunadu. He is still revered there as the king of prosperity and remembered and called on before the harvesting season. Vamana defeats the Devas' (Gods') enemy Bali Chakravarthi (of the demon race) into giving up all of the heavens and earth. King Bali, in an attempt to cement his place as the ruler of all Three Worlds (i.e. the Universe), performed a series of grand yajnas (prayers/sacrifice). The Gods feared that this would cause evil to stalk the Universe, so they prayed to Mahavishnu to assist them. On King Bali's last yajna, Vamana a small brahmana boy appeared. The King was delighted to be graced by the presence of such a holy being, and offered Vamana anything that he wished for. Vamana asked for a piece of land only three paces wide and Bali laughs at the proposal, highlighting the great wealth and land that he owns. However he nonetheless agrees to this wish, against Asuraguru Sukracharya's warning that Vamana is in fact the avatar of Mahavishnu who has come once again to defeat the demon race. King Bali agrees, but this invokes the anger of his spiritual master, Sukracharya, who curses him. King Bali presents Vamana his gift, whereupon Vamana grows in size and steps across the earth in one step, the heavens in the second step. Having now conquered all of Bali's wealth, Vamana asks him where he should place his third step. King Bali, in trying to fulfill his promise, offered his head as the third place. Thus Vamana places his third step on King Bali's head, defeating him completely. Vamana taught King Bali that arrogance and pride should be abandoned if any advancement in life is to be made, and that wealth should never be taken for granted since it can so easily be taken away. Vamana then took on the form of Mahavishnu. He was pleased by King Bali's determination and ability to keep his promise in the face of his spiritual master's curse and the prospect of losing all his wealth. Vishnu named the King Mahabali since he was a Mahatma (great soul). He allowed Mahabali to return to the spiritual sky to associate with Prahalada (the demoniac Hiranyashipu's pious son, also a descendant of the demon race) and other divine beings. Mahavishnu also declared that Mahabali would be able to rule the universe in the following yuga (age). Bali is supposed to return every year to the land of his people, to ensure that they are prosperous. This is celebrated as the Onam festival in Kerala, where he is also called Maveli. Parashurama, Rama with the axe, appeared in the Treta Yuga. Parashurama a Brahmin, the sixth avatar of Vishnu, belongs to the Treta yuga, and is the son of Jamadagni and Renuka. 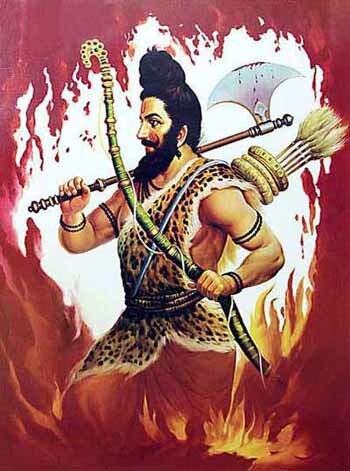 Parashu means axe, hence his name literally means Rama-of-the-axe. He received an axe after undertaking a terrible penance to please Shiva, from whom he learned the methods of warfare and other skills. Parashurama is said to be a "Brahma-Kshatriya" (with the duties between a Brahmana and a Kshatriya), the first warrior saint. His mother is descended from the Kshatriya Suryavanshi clan that ruled Ayodhya and Lord Rama also belonged to. A haihaya King Kartavirya Arjuna (Sahasrarjuna - purportedly with a thousand arms) and his army visited Jamadagni, a Brahmin sage, who fed his guest and the whole army with his divine cow Kamadhenu. The king demanded the magical cow. Jamadagni refused because he needed the cow for his religious ceremonies. King Kartavirya Arjuna (Sahasrarjuna) took the cow forcibly and devastated the ashram. Angered at this, Parashurama killed the king's entire army and, after cutting each one of his thousand arms, the king himself with his axe. As a revenge, the King's sons killed Jamadagni in Parashurama's absence. Furious at his father's murder, Parashurama killed all sons of Sahasrajuna and their aides. His thirst for revenge unquenched, he went on killing every adult Kshatriya on earth, not once but 21 times, filling five ponds with blood. These are the actions which highlight his warrior characteristics. Ultimately, his grandfather, Richeek Rishi, appeared and stopped him. Rama Ramachandra, the prince and king of Ayodhya, appeared in the Treta Yuga. Lord Rama is one of the most commonly adored gods in Hinduism and is known as an ideal man and hero of the epic Ramayana. Lord Rama defeated and killed the king of Sri Lanka, Ravana for capturing and imprisoning his wife Sita in the Ashoka Garden in Sri Lanka. He is considered to be the seventh avatar of Vishnu in Hinduism, and a mythological king of Ayodhya in ancient Indian Puranas. He was born in Suryavansha, later known as Raghuvnsha after king Raghu. Based on Puranic genealogy, Rama is believed by Hindus to have born 20 Million years ago..
Rama is one of the many popular figures and deities in Hinduism, specifically Vaishnavism and Vaishnava religious scriptures in South and Southeast Asia. In Ayodhya - the Indian city believed to be the birthplace of Rama, he is also worshipped as an infant or Rama Lalla. Most of the details of Rama's life come from the Ramayana, one of the two great epics of India. Born as the eldest son of Kausalya and Dasharatha, king of Ayodhya, Rama is referred to within Hinduism as Maryada Purushottama, literally the Perfect Man or Lord of Self-Control or Lord of Virtue. Rama is the husband of Sita, whom Hindus consider to be an avatar of Lakshmi and the embodiment of perfect womanhood. Rama's life and journey is one of perfect adherence to dharma despite harsh tests of life and time. He is pictured as the ideal man and the perfect human. For the sake of his father's honor, Rama abandons his claim to Kosala's throne to serve an exile of fourteen years in the forest. His wife Sita and brother Lakshmana, unable to live without Rama, decide to join him, and all three spend the fourteen years in exile together. This leads to the kidnapping of Sita by Ravana, the Rakshasa (Asura) monarch of Lanka. After a long and arduous search that tests his personal strength and virtue, Rama fights a colossal war against Ravana's armies. In a war of powerful and magical beings, greatly destructive weaponry and battles, Rama slays Ravana in battle and liberates his wife. Having completed his exile, Rama returns to be crowned king in Ayodhya (the capital of his kingdom) and eventually becomes emperor, rules with happiness, peace, prosperity and justice - a period known as Rama Rajya. 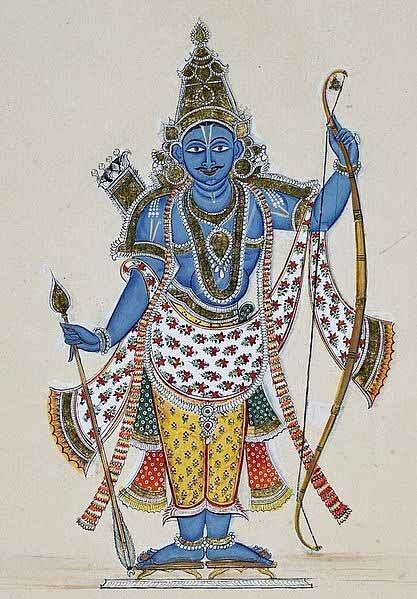 Rama is the great hero of the Hindu Odyssey, the Ramayana, who is made into an avatar of Vishnu. Rama was a real or mythical king in ancient India, whose life and heroic deeds are related by the Sanskrit epic Ramayana. Astronomical data in the Ramayana has been interpreted to suggest that his reign was would have been at approximately 2015 BC, however the Ramayana was written many centuries after this date, probably two thousand years later. It cannot be taken as an accurate guide to the life of the historical Rama, except by devout Hindus. In Hinduism, Rama is regarded as the seventh avatar of the god Vishnu and worshipped together with his companion Hanuman, the monkey-god who assists him in the epic narrative of the Ramayana. He is the Prince of Ayodhya and is banished to a forest by his stepmother. While in exile, his wife, Sita, is kidnapped by Ravana, King of the Rakshas on Lanka (cur: Sri Lanka). Rama, along with Hanuman, rescued her, killed Ravana and becomes King of Ayodhya. Rama also killed Vali, the monkey-King of Kishkindhya. He is protected during his adventures by Agastya, and also rescued Ahalya after she was turned to stone by her husband for having an affair with Indra. In recent years the cult of Rama has become associated with Hindu Nationalism. Rama is held up as a model of Hindu devotion to caste and the rules of dharma, and as a militant opponent of those who would break with it. Krishna (meaning 'dark colored' or 'all attractive') appeared in the Dwapara Yuga along with his brother Balarama. According to the Bhagavata Purana Balarama is said to have appeared in the Dwapara Yuga (along with Krishna) as an incarnation of Ananta Shesha. He is also counted as an avatar of Vishnu by the majority of Vaishnava movements and is included as the ninth Dasavatara in some versions of the list which contain no reference to Buddha. Because of his great Godly power, Lord Krishna is another of the most commonly worshipped deities in the Hindu faith. He is considered to be the eighth avatar of Lord Vishnu. He played a huge role in the Battle of Kurukshetra and helped the Pandavas defeat the Kauravas. He is also a significant character in the epic of Mahabharata. Shree Krishna delivered Bhagwad Gita on battlefield of the Battle of Kurukshetra to Arjun. He, like Lord Rama, is also known for his bravery in destroying evil powers throughout his life. 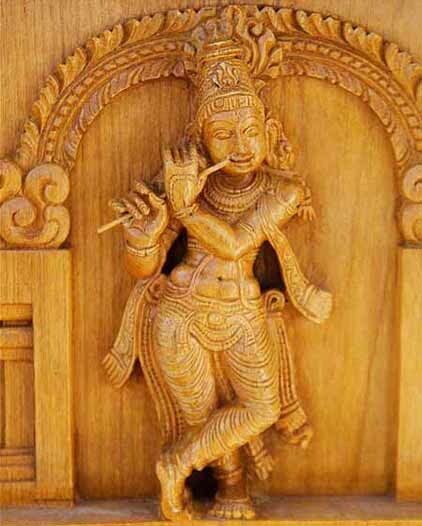 The Lord is usually depicted as playing the flute (murali), indicating spread of the melody of love to people. As the Indian Hercules as he is styled by Megasthenes, the most popular hero of India, is the most perfect avatar of Vishnu. Krishna (meaning black as well as all-attractive one) is a Hindu god, and is popularly considered one of the avatars of Vishnu. Another perspective presents Krishna as existing prior to any material manifestation and prior to any God such as Vishnu, who is assigned the task of maintaining the material manifestation. In this view, Krishna is considered the Supreme Lord. Perhaps the best way to explain the relationship between Krishna and Vishnu is to consider them to be irrevocably linked and that one is the expansion of the other. The Bhagavad Gita, a section of the ancient epic Mahabharata, describes the teachings imparted by Krishna to Arjuna at the beginning of the great battle at Kurukshetra. Parthasarathy is a name of Krishna that refers to his being the charioteer (sarathy) of Arjuna at this time, a name that endears Krishna to Arjuna, who becomes blissful whenever he contemplates how merciful it is that Krishna has consented to become his charioteer. Stories of Krishna's childhood and youth depict him as mischievous and clever, showing that even God has a sense of humor. He is found stealing clothes from the Gopis, breaking the butterpot for ghee, and playing transcendental pranks. This is a counterpoint to another avatar of Vishnu: Rama, he of the straight and narrow path. Krishna also is involved in defending honor, and in fighting demonic personalities. In one such story, Vishnu told Krishna to kill Kamsa, a tyrant and a son of a demon. Krishna and his brother Balarama were threatened by Kamsa, who had been told a son of his half-sister Devaki would kill him. He therefore murdered her first six children. Krishna and Balarama were moved to Rohini's womb to protect them. Krishna was then given to Nanda and Yasoda to hide him from Kamsa; as a child, he was known as Balakrsna, one of hundreds of names for Krishna. 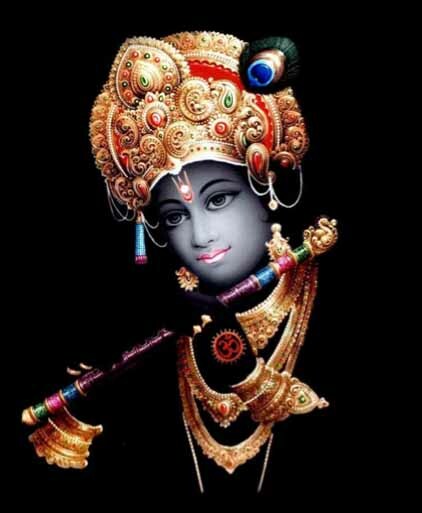 Of all names, Krishna, or all attractive, is considered the topmost. Krishna is 'Sat Cit Ananda', full of bliss and knowledge. To a Hindu, all living entities are part and parcel of Krishna, and each living entity walks within a world made up of the material energy, another one of Krishna's unlimited energies. The amorous pastimes of Krishna are popularly misunderstood and should not be attempted until the nature of Krishna is fully inderstood. For example, to fulfill the desires of his devotees he expanded to be personally present to His sixteen-thousand wives. On one hand this seems adulterous, whereas on the other hand, as expansions of Krishna, all husbands are part and parcel of Krishna and therefore ultimately Krishna is indirectly married to all wives. Despite all these transcendental activities, Krishna's favorite is Radha, daughter of Vrishabhanu. When Krishna advented in Vrindavana, Radha followed within two years. However, she would not open her eyes until Krishna was present before Her. At Her first birthday Krishna, then three, came and pulled down the veil of her crib. She opened her eyes for the first time then. Until Krishna appeared before her, it was as if there was nothing on this earth worthwhile for Radha to see. Radha is the prime object of Krishna's love, and is joined with Him as the Fountainhead of all Spiritual Energy from which the material universes emanate. Balarama is the elder brother of the divine being, Krishna in Hinduism. Within Vaishnavism and a number of South Indian, Hindu traditions Balarama is worshipped as an avatar of Vishnu, and he is also listed as such in the Bhagavata Purana. Within both the Vaishnava traditions and Hinduism generally he is acknowledged as being a manifestation of Shesha, the serpent on whom Vishnu rests. The Bhagavata Purana describes Krishna as the original Supreme Personality of Godhead from whom everything else emanates. As part of this divine 'emanation', Krishna's very first expansion is Balarama, and from Balarama all other incarnations of God then appear. Of the three transcendental elements described in Sanskrit as sat, cit and ananda (eternity, knowledge and bliss), Balarama is in charge of eternity and knowledge. Hence he is worshipped as the supreme teacher or Adiguru. In Hinduism, Balarama (phonetically Balarma - his other names include Baladeva, Balabhadra and Halayudha) is the name of the elder brother of Sri Krishna. Most South Indian Hindu sects and some Vaishnava sects based in eastern India regard Balarama as being the ninth avatar of Vishnu. In either tradition, Balarama is acknowledged as being a manifestation of Shesha, the divine serpent on whom Vishnu rests. Balarama was conceived as a son of Vasudeva and Devaki. Kamsa, brother of Devaki and an evil king, was intent upon killing all the progeny of Devaki, because of a prediction that Kamsa would die at the hands of the eighth son of Devaki. Kamsa threw his sister Devaki and her husband Vasudeva into jail, and proceeded to kill each of their children as soon as they were born. In due course of time, Devaki bacame pregnant for the seventh time. However, this child was not destined to meet the fate of the six previous infants. The unborn child was miraculously transferred from the womb of Devaki to the womb of Rohini, who had long been craving a child of her own. Thus Balarama's other name is also Sankarsana which describes the transfer of the child from the womb. The child was formally named Rama, but because of his great strength he was called Balarama (Strong Rama). Thus, Rohini actually gave birth to Balarama and raised him. Balarama spent his childhood as a cowherd boy with his brother Krishna and friends. He later married Revati, the daughter of King Raivata, ruler of the Anarta province. Balarama is almost always depicted as being fair skinned, especially in comparison to his brother, Krishna, who is shown as dark blue or black in hue. His weapons are the plough and the mace. Traditionally Balarama wears blue garments and a garland of forest flowers. His hair is tied in a topknot and He has earrings, bracelets and armlets. Balarama is described as being very physically strong, in fact 'bala' in Sanskrit refers to 'strength'. Sri Baladeva is famous as being Krishna's dearest friend. In the Bhagavata Purana it is described that after Balarama took part in the battle that caused the destruction of the rest of the Yadu dynasty, and after He witnessed the disappearance of Lord Krishna, He then sat down in a meditative state and departed from this world by producing a great white snake from His mouth, and thus He was carried by Sesha in the form of a serpent. Kalki is described as the last of the Maha Avatars of Lord Vishnu, who will appear to end the Kali Yuga or the Dark Age. 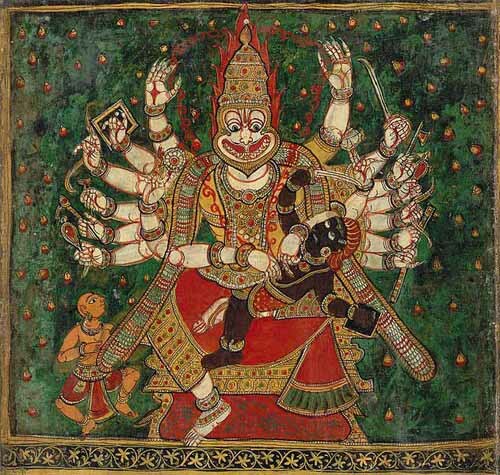 In Hindu traditions, Kalki (also rendered by some as Kalkin and Kalaki) is the name of the tenth and final Maha Avatara (Great Avatar) of Vishnu the Preserver, who will come to end the current Kali Yuga, (The Age of Darkness and Destruction). The name Kalki is often a metaphor for "Eternity" or "Time". The origins of the name probably lie in the word Kalka which refers to "dirt", "filth" or "foulness" and hence denotes the "Destroyer of Foulness", "Destroyer of Confusion", "Destroyer of Darkness", or "The Annihilator of Ignorance". In Hindi kal ki avatar means "tomorrow's avatar". Other similar and divergent interpretations (based on varying etymological derivations from the ancient Sanskrit language, including one simply meaning "White Horse") have been made.In the Buddhist Kalachakra tradition, the Kalki (or Kulika) is the ruler of the legendary Kingdom of Shambhala, where the whole of society is enlighted and the Kalachakra tantra is held and widely practiced. In this form Vishnu will descend when the world is wholly depraved, destroy utterly the wicked, and restore the happy conditions of the Age of Virtue. In Hinduism, Kalki (alt. spelling: Kalaki) ('Time") is the tenth and last avatar of Vishnu. 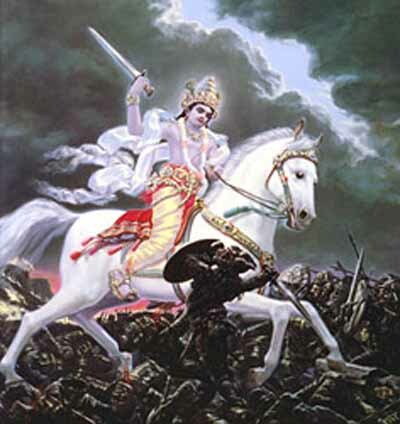 Kalki is expected to appear on Earth at the conclusion of the current Kali Yuga; He will come from the sky on a white horse, brandishing a flaming sword with which to destroy the wicked people of the current world, renew creation and bring righteousness back to Earth. According to Hindu scripture, Kali Yuga (the Age of Kali) began at the end of Krishna's bodily lifespan near the end of the 15th century BC and will last exactly 432,000 years - placing its conclusion near the middle of the 431st millennium AD. Kalki, the 10th and final avatar of Vishnu, is expected to appear at this time, riding a white horse and wielding a flaming sword with which to strike down the wicked. Kali Yuga is the last of 4 Yugas. Upon its conclusion, the world will "reboot" into a new Satya Yuga (Golden Age.) This involves the end of the world as we know it and the return of the Earth to a state of paradise. According to most interpretations of Hindu scriptures, including the Vedas, the Kali Yuga (Age of Kali, also known as Iron Age) began at the end of Krishna's bodily lifespan (approximately 5100 years ago, 3102 BCE) and will last exactly 432,000 years - placing its conclusion in the year 428,899 CE (it began with a year 0). Kalki, the 10th and final avatar of Vishnu, is expected to appear at this time, riding a white horse and wielding a flaming sword with which to strike down the wicked. Kali Yuga began at midnight (00:00) on February 18, 3102 BCE according to the Surya Siddhanta, which is an astronomical treatise that forms the basis of all Hindu and Buddhist calendars. Hindu and Mayan Calendars compared.